Despite our mixed feeling on the adoption case in Ethiopia, there are hundreds of blogs today where so many adopting parents are exchanging their experience. Reading these blogs will still leave us with a vague feeling because we still wouldn’t know the future life situation of these kids and babies from Ethiopia and other third world countries. Though, some of these stories also show that many of these adopting parents are doing their best to give their new children genuine love and secured life. My new 11 year old daughter is teaching me to make injera. But today as I watched her, I realized she is bringing much more to her new family than just a formula for producing proper injera. Each time as my daughter has finished cooking the injera, when she has only a little batter left to cook she calls her 9 year old sister. Her sister comes running to make one last smaller piece of injera for herself. The younger girl them claims that piece of injera for herself, to eat with dinner. The girls said their Habesha (Ethiopian) mother always let the younger girl do this on injera-making day. Each time I’ve watched this little habit, I have been touched at the way my daughter is so obviously cherishing the memories of her Ethiopian mother, and keeping those memories alive for her little sister. Watching them made me think of the way my own mom used to make piecrust and give each of us kids our own bit. Today after my daughter helped her sister make her own piece of injera, she did something new. She gathered the last dab of batter in a cup and called my two year old over. 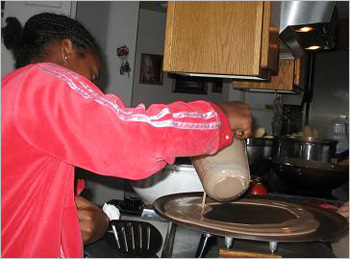 She then carefully helped her pour one tiny, final injera. My two year old grin proudly as she drizzled the batter on the skillet. As I watched, I realized that a new tradition was being born right before my eyes. Even more touching, my 11 year old was choosing to expand her treasured tradition to also include her new family. After the injera was done and the two year old ran off to play, I went to my daughter misty-eyed, and kissed her on the cheek. “Thank you,” I said. She leaned in to receive my kiss and her lips curved into a smile. I am pretty sure that if her Habesha mom could have seen her just then, she would have been smiling as well. When I was straightening my daughter’s bookshelf this evening, I realized that I have one more fun book to tell you about before I end my stint here at Adoption.com. Stacy at www.amharickids.com was kind enough to send me a review copy of one of their new books a few weeks ago. 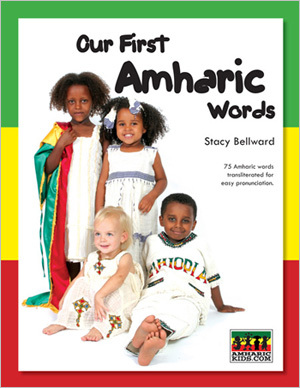 It is called Our First Amharic Words and in 20 pages it teaches 75 Amharic words in a kid-friendly brightly colored format. I gave this book to my 5-1/2 year old for Christmas, and she was just thrilled. She has been listening to her older sisters speak Amharic around the house and is very interested in learning more Amharic herself. This book is just her speed. It teaches kids a variety of simple vocabulary words including numbers, colors, and body parts, and features lots of gorgeous Ethiopian kids. The words are illustrated in pictures, and written in both English and Amharic. Plus the pronunciation of the word is spelled out in English as well. It was interesting to read the pronunciation, try to say the word myself, and then ask our older girls to speak the words. The book’s approximations of the sounds are pretty good!